Last month, the number of homes for sale in the 13-county Twin Cities metropolitan area plunged nearly 24.0 percent from last year to 19,516 – the lowest November inventory reading since 2004. In addition, November 2011 marked only the third month in more than five years (68 months to be precise) where there was less than six months supply of inventory. 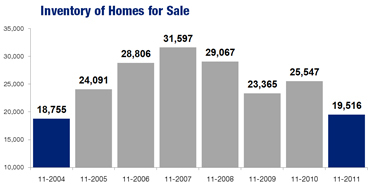 Sellers listed 4,102 new homes on the market, down 13.6 percent from last year. Buyers entered into 3,321 purchase agreements, up 30.2 percent over November 2010. Some sellers are already starting to benefit from less competition. The share of asking price that sellers receive at sale has posted year-over-year increases for the fourth consecutive month. In November, sellers received an average of 90.9 percent of their asking price. That figure was likely helped by the 30.6 percent decrease in months supply of inventory – currently at 5.7 months. Generally, 5 to 6 months is considered balanced. The median home price was down 10.1 percent from November 2010 to $149,250. Lender-mediated activity (foreclosures and short sales) comprised 44.1 percent of all closed sales and 41.9 percent of new listings. The first and fourth quarters of the year tend to see the most distressed sales and listing activity. Consequently, traditional prices fell 9.2 percent to $187,400, foreclosure prices dropped 14.3 percent to $98,500 and short sale prices were down 11.5 percent to $130,000. Market times were down 1.7 percent to 135 days, on average – the second year-over-year decrease in a row. The housing affordability index hit a new record high of 245, meaning that the median household income in the region was 245% of what is necessary to qualify for the median-priced home under prevailing interest rates.